Fensterplatz - Traintour Appenzellerland is the oﬃcial digital travel guide of the Appenzeller Railways. Get on the Appenzeller trains, put on your headphones, start the Fensterplatz app and off you go. Enjoy postcard views with the digital travel guide and learn exciting stories. The GPS-controlled tour guide Fensterplatz leads you through the enchanting Appenzellerland. Experience the advantages of the region in a new way. 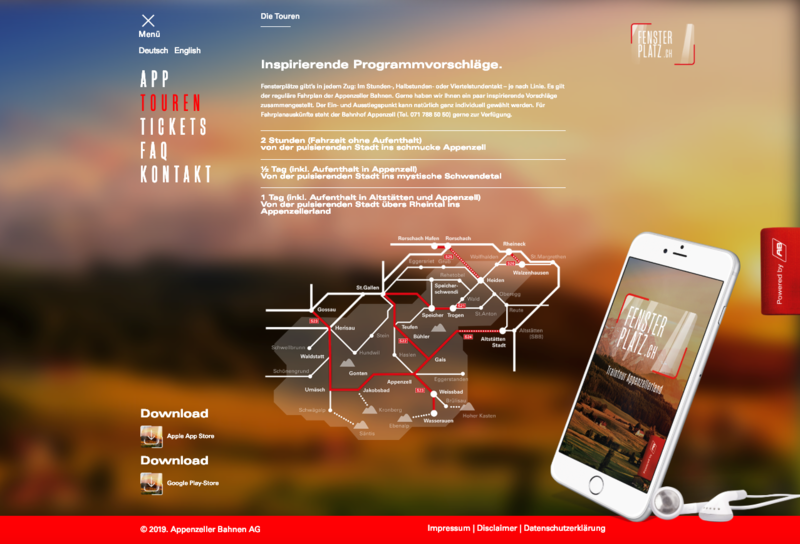 The mobile App Fensterplatz website presents the app, explains the Appenzeller railway network, plays audio samples of the app and answers questions such as possible costs and where to get tickets. The website is available in German and English.